Enough Said (2013) | Tales From The Ipe! 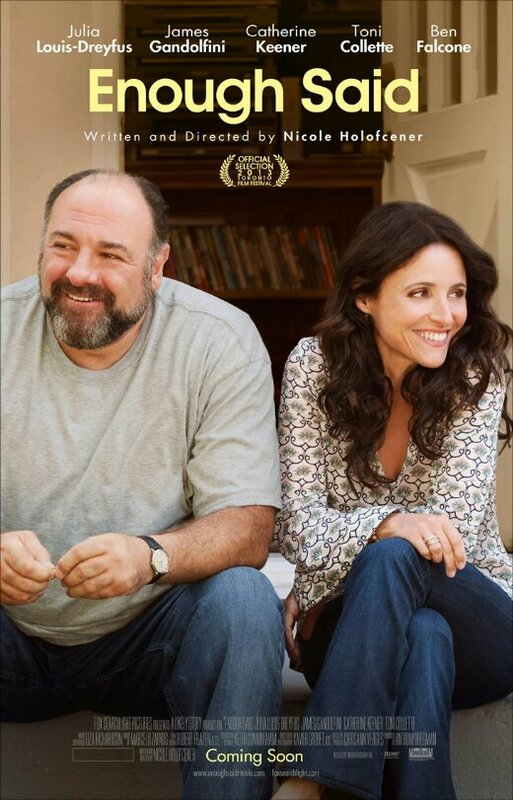 Enough Said (2013) stars Julia Louis-Dreyfus and James Gandolfini in a romantic comedy about two people, probably in their forties, and both with daughters about to leave for college, who meet randomly at a party. Although not initially attracted to each other, they sort of like each other. Julia Louis-Dreyfus plays Eva, a massage therapist, while James Gandolfini plays Albert, a somewhat shlubby fellow who works at a library for classic television — must be a California thing. It’s not a bad film. The plot unfortunately does not have much meat to it. The acting skills of both Louis-Dreyfus and Gandolfini (one of his last film roles) carry the movie, because they are both good performers. It’s an innocent rental, and it’s worth spending your time if you’re a fan of either actor. The film also features Toni Collette, FYI. This entry was posted in Entertainment and tagged california, james gandolfini, julia louis-dreyfus, movies, romantic comedy, toni collette. Bookmark the permalink.